A native of Merrick, N.Y., Jamie Kirsch received a Doctorate of Music degree from Indiana University’s Jacobs School of Music in 2008. 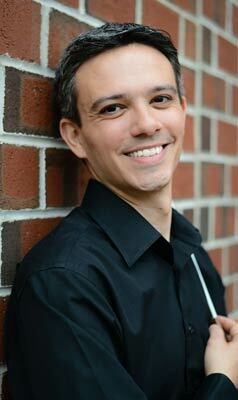 He also holds degrees from the Yale School of Music and the University of North Carolina at Chapel Hill. In addition to his position with CpM, Dr. Kirsch is Lecturer of Music and Director of Choral Activities at Tufts University, where he conducts the Tufts Concert Choir and Chamber Singers. He was Music Director of the Cambridge Community Chorus from 2008 to 2013 and Director of Children’s Choruses at New England Conservatory from 2009 to 2011. Before coming to the Boston area, he served on the faculty of the Blair School of Music at Vanderbilt University, where he was Interim Director of Choral Activities. In recent years Dr. Kirsch has led the Tufts choirs on tours of Nashville, Ireland, and California. Recent Tufts performances include Fred Onovwerosuoke’s arrangements of Songs of Africa; Vivaldi’s Gloria; Mozart’s Requiem; J.S. Bach’s Cantata 140, “Wachet auf”; Carol Barnett’s The World Beloved: A Bluegrass Mass; and Agbadza music from Ghana. Recent CpM performances include Gershwin’s Of Thee I Sing; Beethoven’s Missa Solemnis; Tippett’s A Child of Our Time; Stravinsky’s Les Noces; world premieres of Andy Vores’s Spencer the Rover and James Kallembach’s The Tryal and Examination of Old Father Christmas; Carol Barnett’s The World Beloved: A Bluegrass Mass; J.S. Bach’s Mass in B Minor; and James Whitbourn’s Annelies. Dr. Kirsch lives in Arlington with his wife, Dr. Diana Lemly, and their two children, Amelia and Henry. Jamie Kirsch is sponsored by a generous grant from the George and Alice Rich Charitable Foundation, Alexander Bove, trustee.